The Horror Movie BBQ: Happy SharkOWeen! Shark Week is always a huge deal on the internet. In fact, as long as I can remember, Shark Week was a pretty big deal. For the past 15 or so years, I've actually known people who actually hold shark-themed parties and hold it to the same degree I hold Wrestlemania. Which, you gotta love. I mean, that's some serious shark love, son. So, ready to celebrate Shark Week? Well, you gotta get all the right components for your celebration. Food is essential, obviously. And drinks. Can't have a party without them. Sure, a party without games is more than excusable but food and drink? That's a one way ticket to failure. But aside from Shark Bites gummy snacks and maybe even actual shark sandwiches, there's not a lot of options. 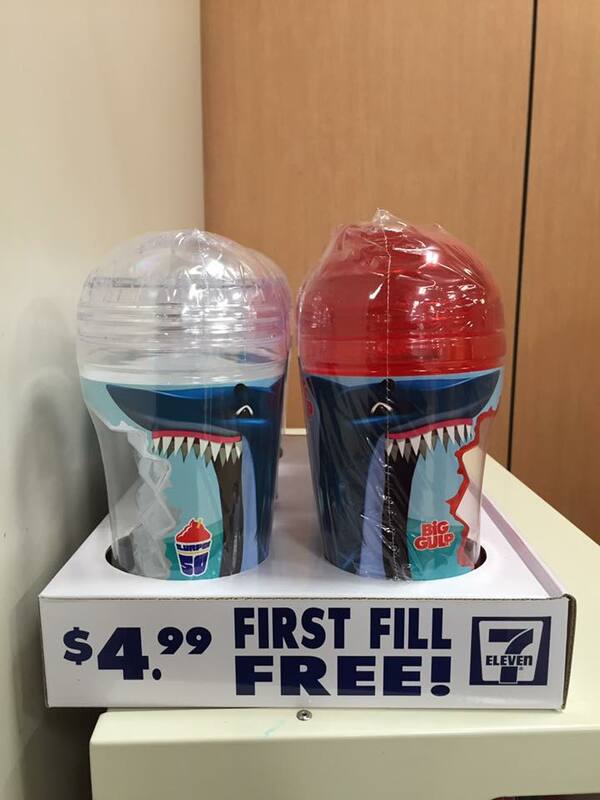 Thankfully, our pals at 7-11 got you covered! Remember how I said if you didn't have a lot of food and drinks present at your party, you'd be the laughing stock of your circles? If all you do is decorate your party with these items, your friends will forgive you while they starve to death. First off, the Shark Bite cup. A very popular item in this offering, for obvious reasons. Sure, you could get a tacky mug at your local junk or souvenir store with a giant shark bite or whatever, but why waste that when you can get something like this? 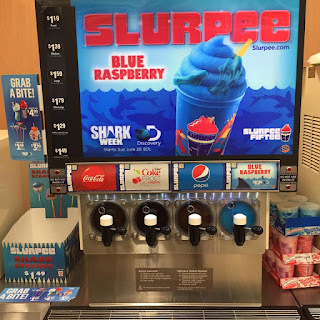 The big bite alone gets your attention but knowing it's not only a Slurpee cup but an official Shark Week cup? Come on, bro. You gotta get this! You're gonna need a straw to drink out of your fancy new cup of yours. And if you're a big fan of 7-11 promotions, you know that in addition to cups, they also offer straws. 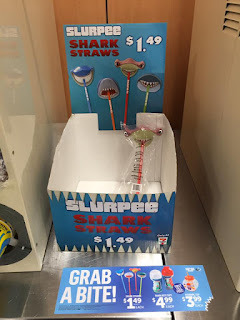 Now, the 7-11 I visited when these photos were taken(earlier this month) only had ONE straw left and it was the one that looked like a Street Shark. But hey, I'm not complaining! Also, being offered is a Blue Raspberry Slurpee! 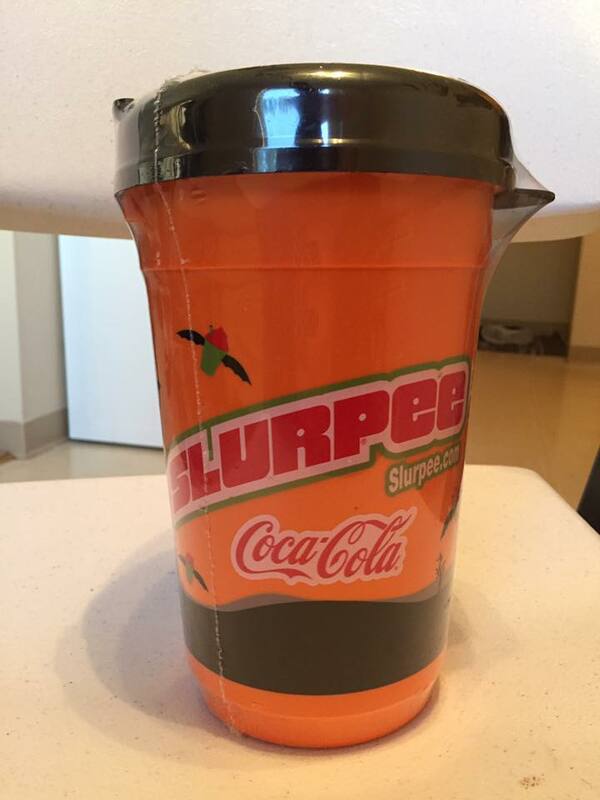 Normally I never deviate from my regular Coke Slurpee, so I didn't even try this, I'm sad to say. But man, after what I tried next, I may have to go back and pick one up. The main offering and no doubt the favorite of the Shark Week promotion is the blue raspberry donuts with a gummy shark on top! These look delicious! Now, I'm not a fan of any of 7-11's donuts to begin with, but I needed to try these just because of their limited availability. Also, I'm not a fan of blue raspberry. So that was also a strike against it. But I gotta admit, I was proven wrong. This is actually pretty tasty! Yeah, the shark was engulfed in one bite. Now the shark was a nice topping but it didn't really add a lot to it. Still. You gotta give them bonus points. I don't know a lot of people who are already buying a donut have the willpower to turn one down that looks like a shark swimming in an ocean of frosting. It won't happen. I'm telling you this. 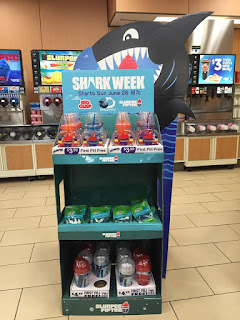 7-11 has some sweet offerings for Shark Week this year and I certainly hope this continues next year and years beyond. It's definitely a creative and fun way for Shark Week enthusiasts to celebrate their favorite yearly event. 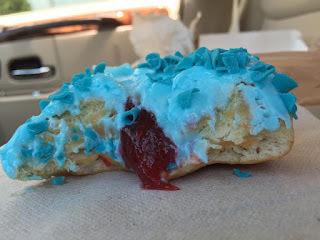 And the donut is downright tasty! Now, as I previously stated, these photos were taken earlier this month. I had been planning to do an entry closer to the beginning of Shark Week. 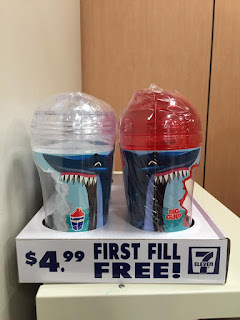 So today, I went back to my closest 7-11 to find a few items for this blog entry including the Shark Bite cup itself. Sadly, it wasn't meant to be as they didn't have any left. 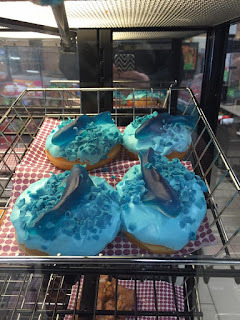 In fact, with the exception of one donut, no other Shark Week offerings were available. So, when a clerk saw me looking he asked if he could help me. So after running to the stockroom to check if there were any available, I was given the option of buying something even BETTER. What's better than a Shark Week cup, you ask? Well...BEHOLD. Oh my gosh, I can't tell you enough how quick I almost shot through the ceiling. In the clerk's hand was a giant Halloween cup from last year. Just laying around!!!! Oh man. This blew me away and I was walking on air. I didn't even know this was made available last year but apparently it was. I may have also screamed "GIVE THAT THE F TO ME RIGHT NOW!" as well. Do you blame me? The cup itself resembles one of those sports bottles I'd use at little league practice when I was 8. So not only is it Halloween, but it's a throwback design too! Shark Week is great, but the Halloween spirit has been really popping up lately with me and my buddies. I'm looking at you, Bill of Casserole of Disaster. You know what I mean! IT TURNS INTO A TRICK OR TREAT PAIL. I can't handle this. I really can't. My head is going to explode. This was a one in a million shot and I don't think it'll happen again. But man, am I grateful for that more than inspired trip to 7-11. I wonder if they had those old WWF/E cups from 2002...I could use another RVD cup! So, while Shark Week is going on now, head to 7-11 to grab some fun stuff to celebrate. 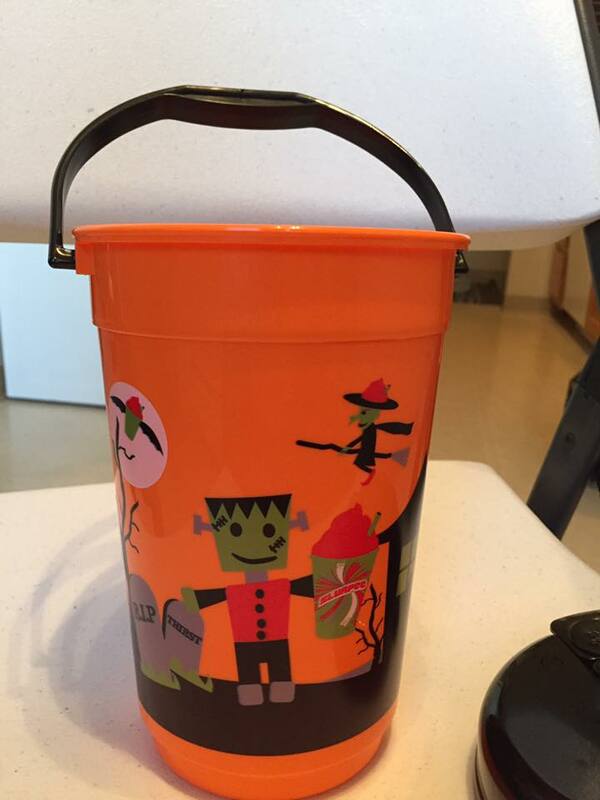 Who knows, maybe they'll have a Halloween pail as well! Happy SharkoWeen? 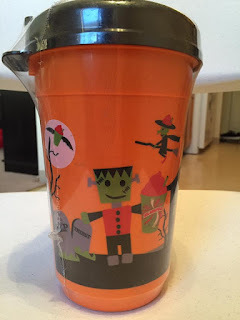 Not a big Shark Week person but that Halloween cup is awesome! Between you, Bill, and a few others, you've definitely jump started my Halloween spirit. You guys take your shark week very seriously! I love all the shark themed party decorations, theyre adorable! I love your enthusiasm for the week! You make me want to celebrate it with a raspberry donut! 5 MORE VHS TO CELEBRATE VCR DAY!